SPG has a program in place where guests can opt to decline housekeeping services. In return SPG will give you either 5$ credit or 500 SPG points per night. Four Points properties also appear to participate in the program, however they only offer you a bonus of 250 points or 5$ dining credit. 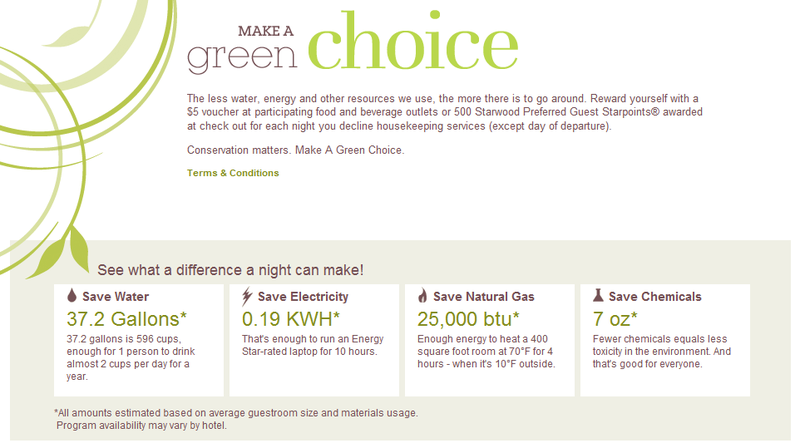 Details can be found by searching for the name of the specific Four Points property and "make a green choice"
The less water, energy and other resources we use, the more there is to go around. Reward yourself with a $5 voucher at participating food and beverage outlets or 500 Starwood Preferred Guest Starpoints® awarded at check out for each night you decline housekeeping services (except day of departure).